IF ANY ITALIAN BIDDER CLAIMS "ITEM NOT RECEIVED" YOU CAN NOW CHECK FOR YOURSELF. DO NOT USE THE "ADVICE OF DELIVERY" SERVICE. IT IS NOT WORTH THE EXTRA COST AS THEY ARE NEVER RETURNED. CONTENT BELOW REMAINS FOR REFERENCE PURPOSES ONLY. I thought this subject deserved a topic all of it's own. There is an extra level of "peace of mind" that is available from the Post Office, at a very affordable cost (40p for Europe). 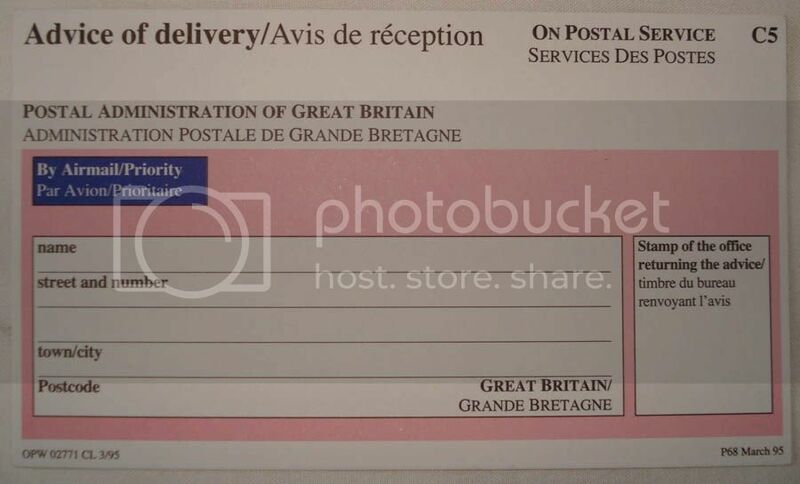 It is the "Advice Of Delivery" slip that can be added to the shipment parcel. See form below. These forms are freely available at the Post Office. My local Post Office had never used this card before, so a lot of messin' about was undertaken to understand how the system works. 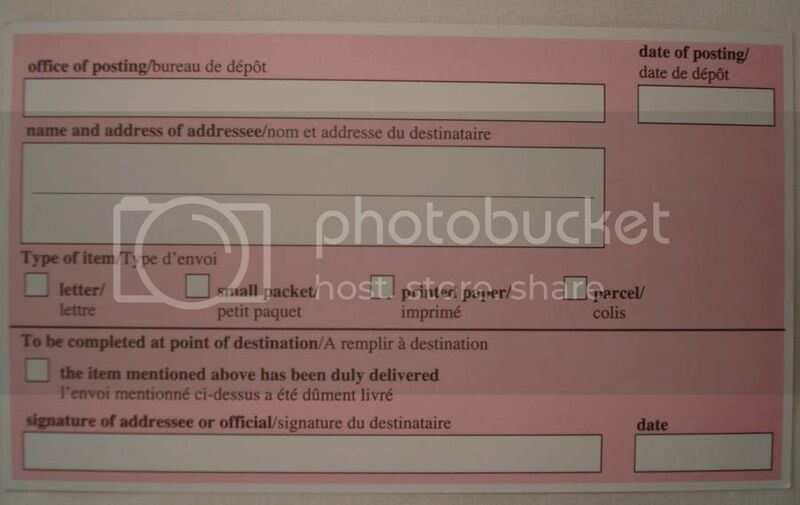 They can fill in these forms for you at the post office, but it would be best to do them yourself, then take them off when a parcel is due to be sent. The front of the ticket is for YOUR RETURN ADDRESS. THE CARD WILL BE SENT BACK TO THIS ADDRESS. The "Stamp of the office returning.." is for the foreign bureau's useage. PLEASE ENSURE TO ADD THE LETTERS "A/D" TO THE FRONT OF THE PARCEL. The rear of the form is used to add BUYERS ADDRESS. The card gets returned to his local base and is then STAMPED BY AN OFFICIAL. 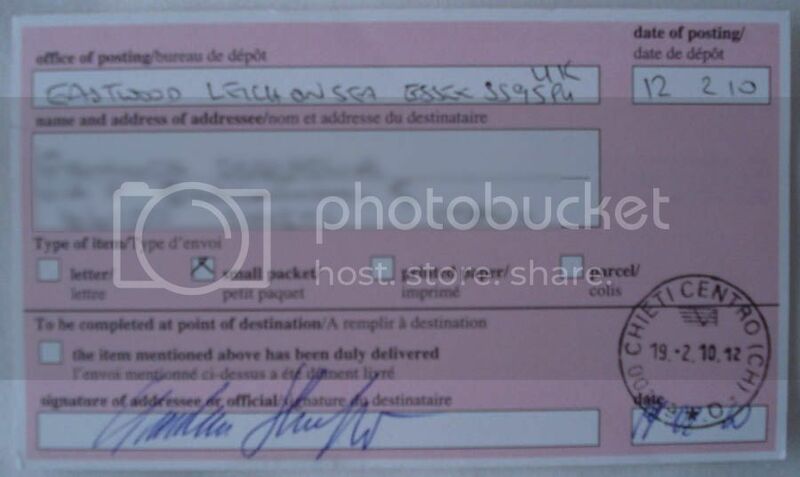 This card is then returned to the sender AS PROOF THAT THE PARCEL HAS BEEN HANDED OVER. I have used this method to send 8 parcels this morning. Will it work ? I don't know. It DOES make me feel a little less "wide open" to scumbag buyers who try it on. I will let you know when (or if) I get any of these AOD cards back to me. I have spoken to a very experienced Powerseller on ebay. he has told me that since he has been using this system he has not lost one single parcel to Italy. Last edited by brian9999 on 26 Jul 2011, 19:20, edited 8 times in total. This is very interesting, I have never been told about this even though they know at my local post office that I have had problems in the past with international signed for. Maybe they (The Post Office) do not advertise the fact you can do this. Please let us know if you get any of the cards back with the proof of delivery. I will try this next time I send a parcel. Don't forget to check this out, http://www.topcashback.co.uk/ref/wendy1956 get cash back when buying online. It will be interesting to see how many cards are actually returned. I would expect MOST Postmen to have seen this slip before, so hopefully they will know what to do. I once had a conversation at my Post Office with several counter staff concerning the merits of both Airsure & ISF. The general opinion was that neither were actually worth the extra money apart from the added insurance for the seller. Now if this system is proven to be reliable I may decide to go back to standard Airmail (If items are worth less than Â£39). During my short time as an ebay seller I have had 2 (out of 3) non-recorded packets go missing. Both were sent to addresses within the UK and one buyer has now been proven to have stung more than 1 seller (after I did some detective work). It is very strange that this option has never been offerered to me in the past. perhaps "they" are trying to bury it. Who knows. I did go onto the Royal Mail website today and for overseas posting they have a live chat icon where you can ask questions and get an instant reply. Mentioned 'Advice of Delivery' and they said this was not available, only ISF for posting to Italy. Will probably have a parcel to send to Italy next week so will enquire at our local PO. Even the insurance is not always a safe bet, I hade a parcel insured for Â£200 go missing, the addressee is a trusted buyer so I refunded him and claimed non delivery with royal mail. Had to take the claim to arbitration, it took 9 months and they decided in royal mails favour because the Italian postal service said the parcel had been delivered but could not produce a signature. This happened before paypal had the seller protection so I now send signed for hoping I am covered by paypal. If it happens again I will claim with paypal and royal mail maybe one will pay up but who knows it could be non. If this advice of delivery works then a signature will be obtained. I had to go through the whole episode again today with another post office counter staff member. They really don't get asked for this very often. Maybe an idea to print out the tickets as my photos above and show it to them. One piece of good news is that one member of staff did tell me that the Italian post office is usually very good at returning these cards. I have had none back yet, but it's very early days. Another thing sightly off-topic. I am also using http://www.parcel2go.com" onclick="window.open(this.href);return false; for sending out bulkier heavy items. It is much much cheaper than the Royal Mail version..and it;s trackable 100%, so Paypal seller protection scheme now rules in my favour. I have saved your photos and I am going to print them so I can show the postmistress what I am talking about. I too use parcel2go as you say it is cheaper for the larger items and trackable. I also use interparcel these are good for smaller but more expensive items as DHL is not as expensive for extra insurance cover I have found and also has online tracking. Interesting ... I asked about this in my Post Office, but they had never heard of it. This service really is a friggin nightmare. I have updated the initial post to reflect this. The system seems to be working, I got my first card back today. This is PROOF that the package was actually handed over....although would paypal see it as proof ? Now that's another story. It makes me feel a whole lot better though. Excellent ... surely Paypal must accept this! I asked my local P.O. about this service and they confirmed that a "button" exists on their menu to allow them to offer this option. Problem is, they don't have any of those pink forms - nor have they seen them for years! I don't want to be picky, but even though there is a signature by the recipient, shouldn't the box "the item mentioned above has been duly delivered" just above the recipient's signature, have been ticked as well. I wouldn't waste your money if i was sending to Italy. From what i've been told, the postman will leave the parcel regardless of whether the recipiant is home or not, even for signed for. So i can't see them knocking on the door, finding no one home, and taking it back to the post office, just because it has this sticker on it. I'm guessing the above example went to France? Yeah agree, the box should be ticked, BUT the signature and the official stamp, together with the senders address AND the recipients addresses are all present. One thing that could be done by the sender is to actually write the Royal mail ISF tracking number on the ticket..this is something I didn't do..but I am sure it's within the rules. I will try and grab a handful of these tickets (+ bags) from the Post Office next time I am around their way. I will send them onto you. Just to confirm the above example went to Italy, and was returned very promptly.